Mannington Commercial has just announced the 2011 tx:style Design Challenge.This is the third year of the competition and the resulting carpet design inspiration is truly electrifying. 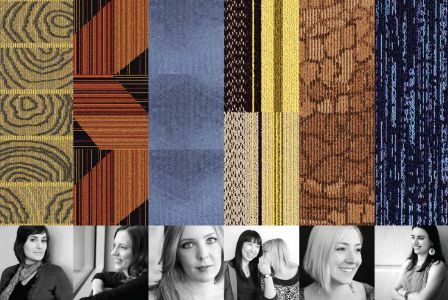 I first wrote about tx:style Design Challenge in Mannington Commercial Carpet Design Competition - tx:style in December 2008. I was thrilled to hear back from Carly Rullman from Scout Brand - who coordinates tx:style - about the 2011 tx:style Design Challenge and asked her for perspective on the competition and on carpet design inspiration resulting from the program. Carly graciously put together the following interview with 2009 tx:style Design Challenge winner, Meagan Webb on her Squareberry Collection. In the Nashville VA Hospital, there lies an area with brand new carpet flooring- a design called Canopy. Inspired by the finite details of nature, Canopy is part of the Squareberry Collection which healthcare designer, Meagan Webb, entered into the 2009 tx:style Design Challenge. Meagan Webb also won the first tx:style Design Challenge. Now in its third year, the tx:style Design Challenge gives designers a platform to showcase their talents and a shot at having their design turned into a complete product line by Mannington Commercial. Meagan tells us about her experience in going from carpet concept to installation. What prompted you to enter the tx:style Design Challenge? I heard about the tx: style Design Challenge at a very sensitive time. The healthcare design firm for which I was employed experienced large layoffs due to the economic challenges that many architecture firms have experienced. I was affected by the layoff; therefore, a former coworker called to check on me and mentioned the contest. She encouraged me to enter, but the catch was—it ended that week! I decided to go for it and got to work immediately. What inspired the Squareberry design? I am amazed by the beauty of God’s creation when hiking. The finite detail that was put into creation astounded me. I noticed that not one leaf was identical to the next. As I pondered, I contrasted the way God designed the world with the way man interprets creation. Man sees everything on a grid. Everything has a size, shape and increment. Squareberry contrasts the organic shapes of creation with the rigid grid that we design and see through our own eyes. This creates a delicate juxtaposition of geometry and organic forms. Did you have any particular installations in mind when you were designing Squareberry? Naturally, I thought of healthcare installations; however, I think the carpet design would work well for hospitality or retail applications, as well. What 3 words would you use to describe Squareberry? My 2009 NeoCon experience was indescribable. It was amazing to network with other designers from around the country and share the Squareberry design story. It was intriguing to learn about the other designers’ inspiration stories. Hearing those stories made me realize one can truly find inspiration anywhere. I really enjoyed getting to share this experience with the other extremely talented finalists. It was an opportunity of a lifetime that I will never forget and hope that many other designers get to experience it as well. What have been the biggest challenges you've faced as a young designer? The biggest challenge I have faced as a young designer is beginning and continuing my career in the current economic times. I have been forced to be creative and diversify myself as much as possible. While looking for a job, I did residential and commercial freelance work, including landscape design, graphic design and interior design, as well as renovating historic homes in Nashville. This was my opportunity to try new ventures and discover what aspects of design I was passionate about. What are your goals for Squareberry? I would love to see the entire Squareberry carpet collection installed in a healthcare facility lobby. I would relish the opportunity to continue designing carpet in the future and hope to build upon this experience. I really enjoyed the detail of pattern making and the process from concept to installation. It opened my eyes to the opportunities in carpet and textile design. What are your goals as a designer? I plan to continue my career as a healthcare designer working at the Nashville VA Medical Center serving our veterans. I find healthcare design a rewarding field by knowing I am creating a healing environment for those who are suffering. To keep my creativity fueled, I will purse my personal venture of renovating historic homes and businesses in east Nashville. Where can someone find an installation of Squareberry? I recently had the opportunity to install Canopy, a Squareberry carpet coordinate, in the Nashville VA Hospital Medical Services department. This was such a rewarding experience that brought the design to life. What makes up the Squareberry line exactly? Squareberry- Juxtaposes organic forms and rigid grid lines. Canopy-Takes a closer look at the tree. Admiring the vast depth of the tree canopy. The deeper you look the more layers you see. Bark- Inspired by the texture of bark, a grid like texture that repeats. The Squareberry carpet collection is offered by Mannington Commercial. Meagan Webb currently works as a Healthcare Designer at Nashville VA Hospital and continues to do home and business renovations in east Nashville. This year’s tx:style Design Challenge launched Dec. 6th, 2010 and goes until Feb. 16, 2011. The contest is open to all practicing designers and architects of varying experiences. To enter your winning design, go to www.manningtontxstyle.com. Thank you, Carly and Meagan, and all the best to the Mannington Commercial 2011 tx:style Design Challenge participants! Photo courtesy of Mannington Commercial. Did you participate in the 10/15/10 live web chat with UK designer George Clarke? If not, you can still enjoy the replay and glean carpet style trends, colors and ideas from the lively exchanges that took place. 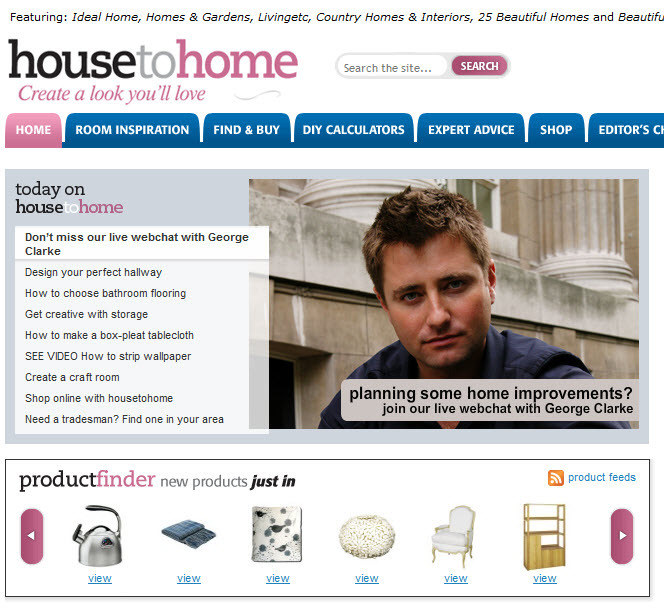 Here is a link to the housetohome webchat with George Clarke. I thought I would recap for you George's comments relating to carpet since they are so relevant to the Carpetology Blog and bring to life some great carpet style trends and ideas. By the way, George has carpet in his home. During the webchat he explained that he has carpet in his bedrooms and is about to install 1000 sq. feet of carpet in his newly designed basement because he wants that space to be "sofy, cosy and quiet..."
My friends at Funonthefloor.com invited me to ask the first question. What an honor! Let’s kick off with a question from Christine B Whittemore of Carpetology - "My readers are very interested in carpet style trends. 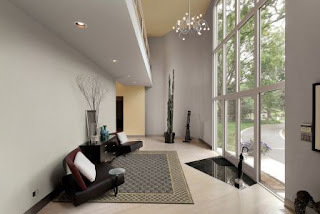 What's the best way to incorporate the latest carpet patterns and styles in home design?" Bold colours or simple stripes are a really good way to incorporate the latest trends... this Season's 'Ballet Russe' is a perfect example of a latest trend - get the look with a rich red or plum carpet in a velvet pile - these are perfect and luxurious for bedrooms. There are loads of ideas and more information on this at www.funonthefloor.com. On the best carpet style for high traffic areas - asked by Blue Ant Studio blog: A carpet labelled ‘Heavy Domestic’ will be good for high traffic areas. Berber carpets, also known as looped pile, are very durable and practical. A cut pile or twist is good for any room in the home. Read through the web chat replay for some of the other tips, trends and ideas that George Clarke shared. As you can tell from these few responses the energy and enthusiasm were high - on George's part and from those participating and asking questions. Don't you think? And, finally George Clarke's website! Back in February 2010 - seems like ages ago - Surfaces organized an insider's tour in Las Vegas of the Encore, hipper, younger sister to the Wynn, led by the Encore design team. The experience - because it captured intense Las Vegas style inspiration - was unforgettable. Luckily, I had my camera handy and kept it busy thereby allowing me to share with you several bathrooms. It shouldn't come as a surprise that opulence is a dominant theme throughout the Wynn and Encore in terms of unique materials and themes and fascinating juxtapositions of products. We started out at the Wynn Las Vegas. This first bathroom is located in the shopper section - definitely not your average shopping mall public restroom! Notice the beautiful materials and the combinations of colors, shapes and textures. I love the contrast between the bold floor pattern and the more soothing solids of the other surfaces. As you transition from the Wynn to the Encore you notice butterflies. The effect is subtle because the color scheme works together. The Encore theme is the butterfly which symbolizes metamorphosis; it's considered good luck across all cultures. I took many photos of all of the instances of butterflies: in store windows, on the walls, in sconces. This bold butterfly carpet pattern was repeated in tile patterns. Truly marvelous! Moving on to another bathroom. The Women's Room: What's That in the Mirror? As you exited the bar to make your way to the foyer, these marvelous torsos lined the wall. This image I took along our walk. I just had to include it. You are right in concluding that it has nothing to do with the club we just left. I consider it timelessly elegant, possibly even reminiscent of the 60s?. Finally, this bathroom was in one of the special ritzy suites. I couldn't get over the soothing green color scheme and the rich, sparkly insets and details. Luckily, the mirror frames were simple shapes. Isn't that fabric scrumptious? Check out Becky Carroll's post Bathroom Blogfest: Stuck in the 60s? for other Las Vegas bathrooms. What do you think? Are you inspired by Las Vegas Style Inspiration? Surfaces, the annual exposition for the flooring industry, occurs once a year in Las Vegas. For Bathroom Blogfest 2010 - taking place this week - I thought I would share with you what I consider a clever way of showcasing flooring products. Now, for the record, I don't have much related to carpet or rugs to share with you in this post. However, Bethany Richmond has a really interesting blogpost about bathroom rugs and carpets you may find inspiring. Jeanne Byington writes about Nostalgia and Bathrooms with tons of practical advice. Chris Moline shares interesting Bathroom ideas in "Stuck in the 60s?" inspired by Mad Men - this will be fun! Paul Anater's post about Bathrooms stuck in the 60s includes a rich selection of photos. His take: being stuck in the 60s may not be a bad thing! Renee LeCroy asks Are You Overdue for a Bathroom Redo? These pictures below are ones I took on the last day of Surfaces having just finished using the women's bathroom on the ground level of the Sands Convention Center. I couldn't get over how cool the effect was. The product manufacturer, Armstrong, had vinyl product samples displayed in the women's room. I wish I had checked whether the men's room had also been decked out. Next time. In any case, the product does a great job jazzing up, warming up and improving the acoustics of an otherwise uninspired and rather sterile space. Now, imagine Bethany's bathroom mats on there... Nice, don't you think? Like Bathroom Blogfest on Facebook. Are you passionate about Home Design & Improvement [and how carpet fits into the overall picture]? 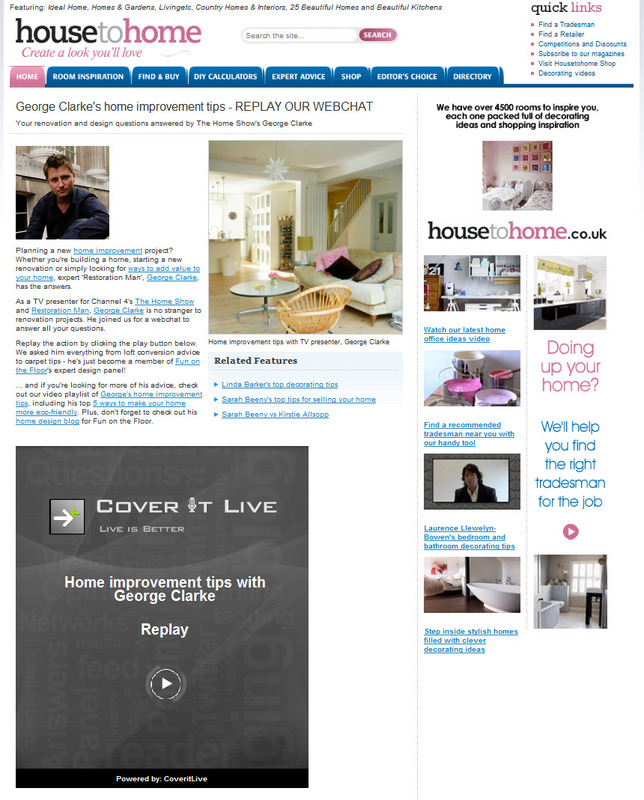 If yes, you might be interested in a HousetoHome Live Web Chat taking place this Friday, October 15, 2010 with George Clark, UK architect, writer and lecturer, hugely successful property TV presenters on UK television and newest addition to Fun on the Floor's panel of experts. Be sure to register! Sign up below. Here is some additional information on George Clarke from my friend Patrick Finn at FunontheFloor.com. 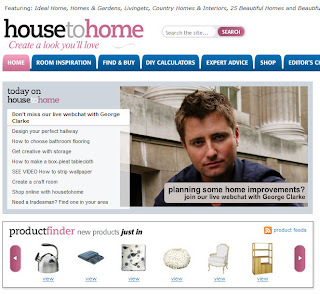 "Many of your UK readers will know George from The Home Show [launched in 2008] and Restoration Man [launched in 2009] programmes that he appears on at Channel 4. After three successful series of Build A New Life for Five from 2003 to 2006, George became the face of architecture at Channel 4. George will be on hand via this Live Design Web Chat to answer questions on home renovation and design projects so I feel sure that this will be of interest to your audience. May I request that you let your readers know about this unique opportunity to quiz him about anything from carpet tips to basement conversions." As I mention above, George recently joined the Fun on the Floor panel of carpet experts and now has a home design blog at Fun on the Floor where he adds more useful help and advice on all sorts of home improvement projects there. Do register for Friday's event to participate in the Live UK Design Chat with George Clarke. I bet you will be inspired! By the way, you might also be interested in the HousetoHome Blogs. 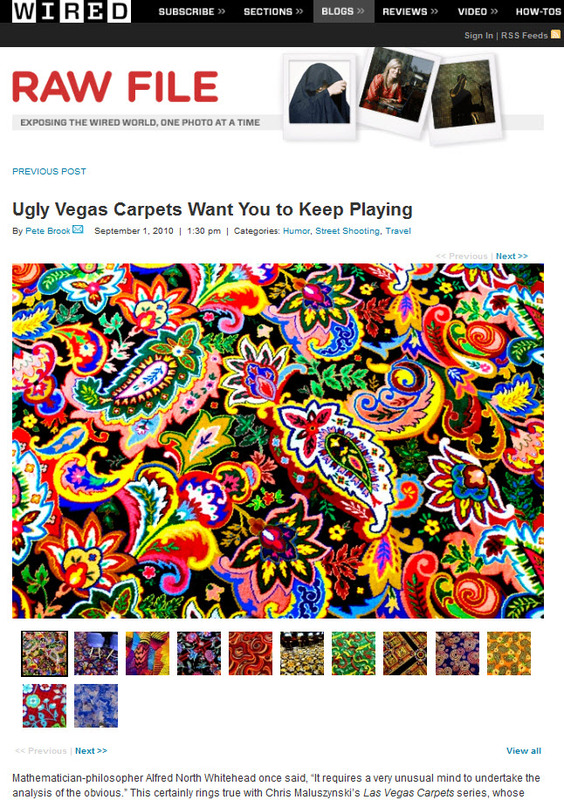 Vegas Carpet: Surreal, Intense and Addictive? What's your opinion of Las Vegas Casino carpet? Love it? Hate it? Tolerate it as a necessary evil? Is it too intense, somewhat surreal while also addictive? This Wired magazine article builds on a related story in The New Yorker [see The Carpets of Vegas: Floorscapes at the Casino]. 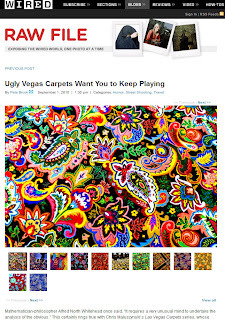 Titled Ugly Vegas Carpets Want You to Keep Playing, it, too, brings up Chris Maluszynski's Las Vegas Carpets photographic series. In the article and the series, you'll experience the surreal quality of both carpet and Las Vegas. Where else but in Las Vegas can such intensely exuberant and patterned carpet be more appropriate? Where else can it support addictive activity? I love the points made by Dave Schwartz, Director of the Center for Gaming Research, at the University of Nevada Las Vegas. He states that “casino carpet is known as an exercise in deliberate bad taste that somehow encourages people to gamble.” Talk about addictive! For me, prolonged exposure to the visual intensity [and energy] of the various bold and colorful patterns creates sensory overload. That's when I seek refuge in my hotel room where if I'm lucky, as you can see in Wow! Mirage Carpet, a tastefully subdued design scheme will definitely offer a well-deserved break! What's your take on Las Vegas carpet? Do you have a preferred Casino pattern? Let me know! 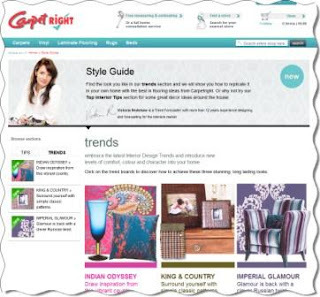 If you remember from Carpetright Style Guide: Carpet Inspiration Online, Carpetright in the UK offers carpet design and style inspiration via online trends and monthly tips. These are created by Victoria Redshaw and have recently been updated with new carpet style trends! What I love most about how Victoria presents these carpet style trends is that she suggests how to get the look, create interesting design groupings, then complete the look with carpet recommendations. In addition to the style guide trends, you'll find two new interior design tips since my last post, both extremely practical and relevant: How to make a small room look bigger and Simple Rules for Selecting Colours. I invite you to go explore. Then, will you let me know which carpet style trend you find most appealing and which interior design tip most valuable? I love practical solutions especially when they help me deal with messy hassles such as carpet stains. 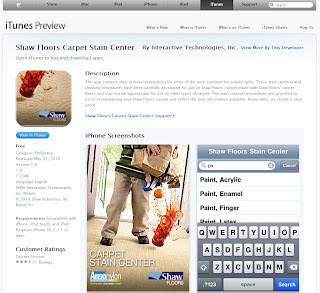 The latest I've come across is an iPhone app offering specific instructions on how to remove carpet stains! It's the Shaw Floors Carpet Stain Center. Available free, you can check it out on iTunes or download it directly to your iPhone, iTouch or iPad by searching on the exact name or also "carpet stain" [there may be a few other search terms, but my iPhone isn't cooperating at the moment]. 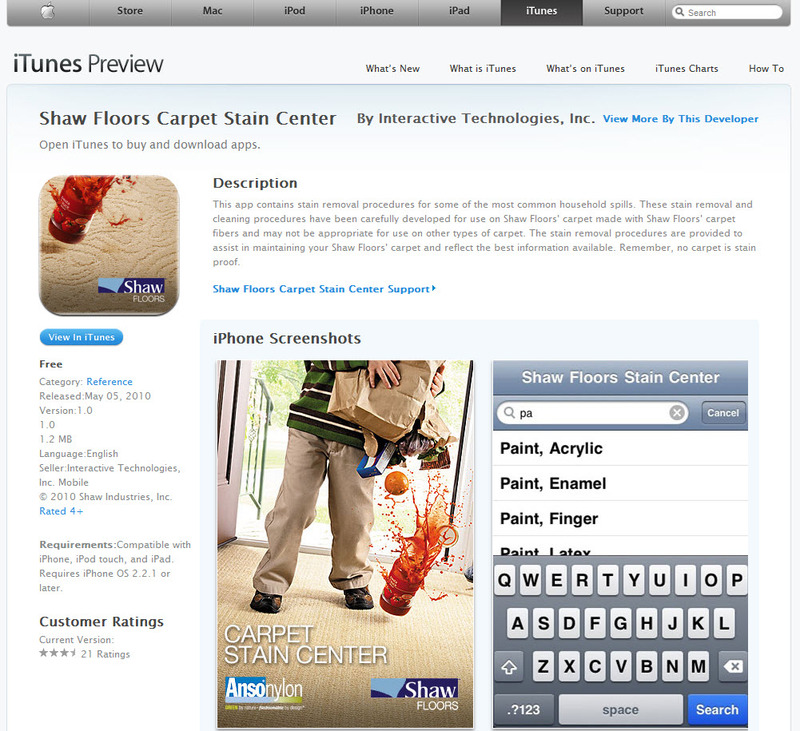 The application lets your search alphabetically through almost 1000 different stain types. Alternatively, you can type the specific stain into a search window. Once you identify your stain, the app offers a recommended stain removal procedure, specific techniques and solutions [aka cleaning solutions] to have handy. You do want to act quickly when you have a carpet stain. The technique to use for dealing successfully with carpet stains is "Blot, don't Rub!" Check out this post on How To Remove A Carpet Stain for more detailed instructions. Removing carpet stains takes time. I encourage you to download the app which is mighty handy for dealing with carpet stains. And, then, let me know what you think! I love how carpets and rugs add warmth and visual appeal to a room. Rugs, in particular, create design accents that can define the purpose of a space, generate conversation and generally convey a sense of hospitality to a space. Take this room scene from Nourison with its magnificent styled rug. My friend, Elise Demboski, executive director North America of Wools of New Zealand, forwarded me this image. She thought I would enjoy it. Style VA26 from Nourison's Vallencierre collection features an elegantly eclectic transitional motif that enhances both traditional and contemporary interiors with a sophisticated fashion accent. All rugs in the Vallencierre collection carry the Wools of New Zealand brand and are hand-washed, hand-carved, and hand-finished for an appearance that is both luxurious and unmistakably fashion-forward. Note: what the photo above doesn't properly capture is how textural the pattern is with its hand-carved quality. Truly scrumptious! What do you think about this particular carpet rug style? By the way, you might consider checking out Elise's blog Wool For A Better World. How many flooring or carpet retailers have you encountered that offer customers interior style advice? Not that many, right? Imagine then being inspired and guided online by an incredibly talented interiors trend forecaster who not only offers advice on how to make the most of your flooring or carpet decision, but also helps integrate the floor into an overall design concept. That is what Carpetright in the UK has done with its Style Guide. I learned about the Carpetright Style Guide from my friend Victoria Redshaw whom you may remember from Celebrating Carpet: UK's Fun on the Floor with Style, Design Trends 2010: Carpet, Floors & More, and Surfaces Blog: Source of Carpet Style Trends & More! She provides the guidance, inspiration and overall interior style advice for the Carpetright Style Guide. Here is the post Victoria wrote on the subject in the Scarlet Opus Blog. It's titled Reaching Out to Customers With Carpetright. She explains that the Carpetright Style Guide helps customers understand how important flooring is to the overall design scheme and achieve an entire look rather than a piecemeal one. As Victoria explains "we wanted to help customers to understand how flooring can be an integral part of creating the hottest new interior trends in their own home... and of course let them know what those hot trends are." The lowdown is as follows: every six months, Carpetright will showcase 3 new interior trends on their website and via in-store posters with montages of home products currently available at UK stores. Trend boards will help demonstrate how the entire look comes together. I can't wait to read about the July tip! 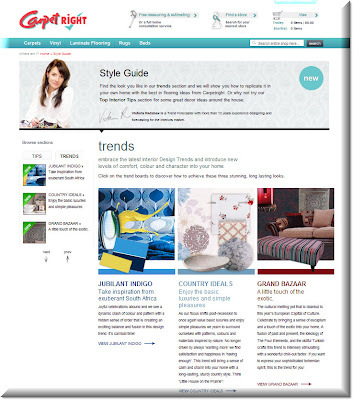 The Carpetright Style Guide is practical, inspiring, helpful, educational and truly beautiful! And I love how completely it integrates carpet and flooring into the final look/feel of each design concept. Congratulations Victoria and Carpetright for creating such a rich source of carpet inspiration online and integrating it with your in-store experience! Shaw Floors and CCA Global have just launched a new carpet product together. It's called Tigressa SoftStyle, consists of a collection of 31 carpet styles and is available at Carpet One Floor and Home and Flooring America. What's particularly unusual with this carpet style introduction - beyond its "exceptional strength and ultimate softness" is that it involves bloggers, a first for the flooring and carpet industry. That's right, on May 19th and 20th, 2010, Shaw and CCA Global invited bloggers to participate in a two day event, starting at Barnsley Gardens with an inspiring presentation from Amy Devers, HGTV's DIY to the Rescue and the next day at Shaw in Dalton, GA, with a visit tour of the Shaw Design Center and mini-manufacturing process, the creation of trend boards, and firsthand Tigressa demonstrations. Carrie Malatesta from Building My Green Life, about living, working and building sustainably. Timothy Dahl from Charles & Hudson, an independent resource for do-it-yourself enthusiasts seeking the latest in home improvement tips and techniques as well as the finest tools and hottest news in the home building industry. Maria Killam from Colour Me Happy which exudes her fresh take on contemporary and her love of color. Jill Seidner from Material Girls which offers design inspiration from coast to coast. Jocelyn Hagan and Kim Fauth from One Project Closer,filled with tips, advice, experiences, products, reviews, giveaways, finances, how-tos, tools and more that help us build better homes, communities and lives. Preston Koerner from Jetson Green, a daily-updated web magazine blog obsessed with Green Living, wasn't able to attend. He did, though, describe in A Durable Soft New Carpet Tigressa the Tigressa materials he received. Attending from the flooring trade media were Woman In Flooring Kim Gavin from Floor Covering Weekly [see CCA & Shaw launch Tigressa via bloggers] and Emily Hooper from Floor Covering News [see CCA launches Tigressa, markets via bloggers - note: registration required]. I was invited to participate and, unfortunately, couldn't attend. My friend and former colleague, Bruce Conlon -- we both called on CCA Global, he for Shaw and I for Solutia/Wear-Dated -- graciously sent me information so I could share it with you. To give you a feel for the event, I thought I would share with you posts written by the blogging attendees. [Kim and Jocie from One Project Closer Tweeted the event. I wish I had a transcript :(...] Here's their summary: New Tigressa SoftStyle Carpet Line By Shaw - Rolling Out this Weekend. I love the detailed and visual overview that Material Girls' Jill Seidner shares in Tigressa SoftStyle carpet event from Shaw Floors. Colour Me Happy's Maria Killam offers a marvelous visual description of the entire event in Tigressa SoftStyle; 4 Steps to Removing Stains from your Carpet. I love the photos of the trend boards! There's The Decorating Diva's Carmen Natschke summary: Shaw Floors' Tigressa SoftStyle Carpets Debuts. And in Traditional Home Blogs, Amy Bleier-Long describes eye on the tiger - behind the scenes at shaw. What makes Tigressa Softstyle carpet different? According to FloorDaily,Tigressa is a "line of soft nylon carpets with fibers half the width of human hair... More fibers yield better color saturation within the carpet as well as greater durability and wear resistance since it spreads wear out across more individual threads." DailyDanny's post Introducing Shaw Floors Tigressa does a great job of explaining what makes Tigressa unique as does Charles & Hudson's Timothy Dahl in Tigressa Softstyle Carpet From Shaw Floors. What's the story behind the name "Tigressa"? The Tigressa introduction includes a strong commitment to saving wild tigers in Asia, where they are on the brink of extinction. "For all Tigressá sales made between May 16 and August 20, 2010, we’ll donate a portion of the proceeds to the National Fish and Wildlife Federation’s Save the Tiger Fund (STF). STF sponsors effective efforts to stop the killing of wild tigers, enabling them to recover and flourish, and empowers local people to live in balance with natural resources, providing tangible benefits to them whenever possible." "One grand prize winner will receive a trip for two to India to see the tigers, a $12,000 value! Three first prize winners will receive a $1,500 gift card for Tigressá carpet, and five second prize winners will receive a Nikon COOLPIX camera. Enter now for your chance to win! Increase your odds of winning by sharing on both Facebook and Twitter. For every entry on Twitter, we will donate a dollar to the Save the Tiger Fund to help support the efforts to save this regal creature from extinction*." The sweepstakes lasts until August 20th. Shaw and CCA will donate $1 to the Save the Tiger Fund. Note: you must issue the tweet from the sweepstakes registration page. Here is Materials Girls' post about Save The Tiger: Tigressa Carpet & Save The Tigers. 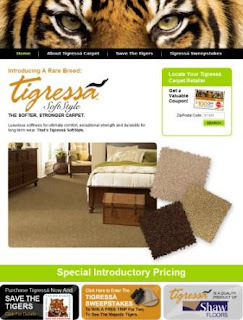 Now onto the Tigressa carpet product itself. From the samples Bruce and Empower MediaMarketing sent me, Tigressa feels lush, thick and soft. The brochures describes it as "luxurious and durable" with "ultra protective color and microfiber technology, supreme, silky softness, stronger than ordinary carpet, richer stronger color." In terms of nitty gritty details, Tigressa is made from type 6 nylon which can be repeatedly recycled into new nylon. For that reason, it is categorized as a Green Select product at Flooring America and Carpet One. Building My Green Life's Carrie Malatesta describes what she learned about carpet sustainability in Shaw Floors: Tigressa Carpet Launch. That, then, is the lowdown of Tigressa SoftStyle Carpet from Shaw based on the accounts of the bloggers I've listed above. Look for it at Carpet One and Flooring America and then, please, let me know what you think. Note: Photos Courtesy of Shaw Floors. Yes, the amazing 2010 FIFA World Cup TM soccer or football [depending on where in the world you are :)] competition is underway in more ways than one. That's right, it extends to grass carpet! According to Artificial grass woven into real turf at World Cup, Desso Sports Systems has created the Desso GrassMaster which ensures that the World Cup stadiums offer the best possible grass carpet for the teams playing. It's a grass turf solution that has been used in the United States for the National Football League's Denver Broncos, Green Bay Packers and Philadelphia Eagles as well as in Europe for rugby (a.o. Vodacom Stormers-Newlands Stadium). "Desso GrassMaster is a sports field of 100% natural grass reinforced with Desso synthetic grass fibres. The unique element of this patented reinforced natural grass system is the 20 million artificial grass fibres injected 20 cm deep into the pitch. During the growing process, the roots of the natural grass entwine with the synthetic grass fibres and anchor the turf into a stable and even field. In this way the natural grass fibres are well protected against tackles and sliding. Moreover, it ensures better drainage of the pitch. Despite the fact that 3% of the pitch is made up of synthetic grass fibres, Desso GrassMaster gives players the feeling of playing on a 100% natural grass pitch." Can you tell that I'm in awe! GrassMaster truly goes beyond Cushioning Play with Astro Turf Carpet. How marvelous to see it being put through its paces at the 2010 FIFA World Cup, don't you think? And, to put all of this competition - grass carpet and football or soccer - into perspective, have you watched this Nike Football video? May the best team and grass carpet win the World Cup! This post about How To Care For Shag Carpet is dedicated to my friend Izzy who, in Isabelle Garland's First Smoke Rise Encounter, referred to an extraordinary sight: the raking a shag carpet. Raking with a pilator as CRI's Bethany Richmond so elegantly demonstrates in this photo, constitutes a best practice in caring for shag carpet. In my Wear-Dated days, with the expert guidance of Annette Smith, I proudly put together a Shag Carpet Maintenance document. I discovered, in looking for shag raking ammunition for Izzy, that the document was no longer available. However, I'm able here to recreate most of the content and offer you expert advice on how you should care for your shag carpet. Shag carpet is back. It’s thick, plush, luxurious and comfortable. It makes fantastic conversation piece area rugs and scrumptious wall-to-wall carpet. For that reason, we share with you important information on how to care for and maintain your shag carpet. The best way to care for your shag carpet is to vacuum it with a suction-only vacuum. If your vacuum has a beater bar, be sure to disengage it when vacuuming your shag carpet. When disengaged, the brushes on the beater bar should not come in contact with or abrade the fibers as you vacuum. The reason? 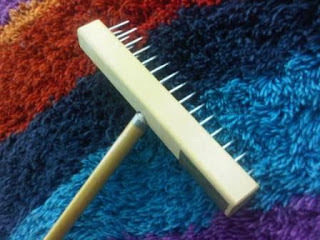 Using a beater bar or brush may cause the yarns to “feather out” or lose their twist, resulting in pilling or fuzzing. That means your shag carpet would no longer look they way it did when you fell in love with it;. It would lose its unique character. If you have a particularly thick shag carpet, you might consider using a pilator [see close up in photo] or grooming rake to keep your carpet looking well-groomed and carefully coiffed. Caring for your shag carpet with frequent and suction-only vacuuming will ensure that your shag carpet provides you with the Beauty, Comfort and Durability you expect from it. Something else to consider. Your vacuum… Have you checked whether it is certified through the Carpet and Rug Institute Seal of Approval/Green Label Vacuum Cleaner Program? The program has established industry standards on vacuum cleaner performance. Visit www.carpet-rug.org for details and listings. For additional carpet care and maintenance guidelines, definitely speak with your carpet retailer. For those of you with shag carpet, would you add anything to this post on how to care for shag carpet? 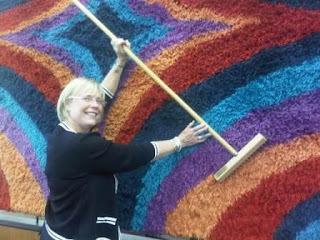 Thank you, Jenn Mendez and Bethany Richmond from the Carpet and Rug Institute, for capturing the shag pilator in action! Check out the Carpet and Rug Institute Blog for many great carpet related resources. Do you remember reading about Mannington Commercial Carpet Design Competition - tx:style? I first wrote about it in December 2008. Well, I have news for 2010! According to Carly Jayne Rullman, account coordinator for ScoutBrand in Birmingham, AL, Mannington's tx:style Design Challenge is even Bigger and Better! I invited Carly to tell us more. Last year, The Carpetology Blog introduced Mannington Commercial’s tx: style Design Challenge, an online competition among young, aspiring designers to have their design made into a full carpet collection. And because the competition was so popular among its 6,000+ registrants, Mannington Commercial re-launched the website this year. This year, the website is even better. In addition to being the website for the Design Challenge, it is an online design community that is up and running year-round. The site presents monthly contests, a mood board where users may upload what inspires them and a product development tab. 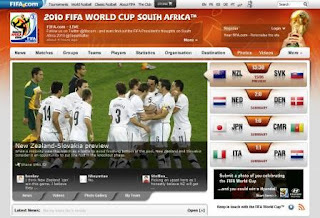 The monthly contests have brought many to the online community. Simple in nature, the prizes are big—a trip to Greenbuild, a $500 gift certificate to West Elm and the current contest that will give one lucky winner a trip to NeoCon. And there’s more where these come from. The "Who wants to go to NeoCon?" contest ends May 27th and the winner will be announced June 1st. At this point, Mannington Commercial has chosen six design finalists who are in the running for the top honor. You can see their unique designs on the tx:style website, as well as video clips to get to know their personalities and the inspirations behind their work. Be sure to vote for your favorites! Online voting closes June 14th, but remains open to visitors at NeoCon (June 14-16). If you can make it to NeoCon this year, the finalists will be in Mannington Commercial’s showroom #1039. An entire section is devoted to tx: style, where the finalists will be showing off their design boards and encouraging online voting. Additionally, there will be awesome giveaways, including fun bags and iPads. But don’t forget- tx: style online design community will remain active throughout the year, so there is always a chance to interact with other young designers and prizes to win. I hope you'll go vote. And, if you are passionate about designing commercial carpet, won't you consider joining the Mannington Commercial tx:style design community? Surfaces Blog: Source of Carpet Style Trends & More! 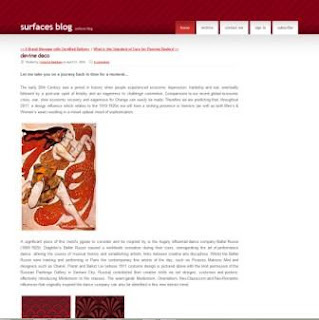 Have you had a chance to visit the Surfaces Blog? If you're looking for design inspiration, ideas on carpet style trends and colors, with a dash of carpet - or surfaces - industry practicality thrown in, you will enjoy your visit! My very favorite contributor is Victoria Redshaw who regularly shares entrancing thoughts and images that send my soul singing because of the combination of colors, patterns, and artistic inspiration. In addition to flooring and carpet style trend information, the Surfaces Blog offers flooring business insights. Paul Friederichsen shares perspective on marketing and branding; Warren Tyler on sales; Lew Migliore on how to deal with flooring issues and how best to care for flooring. And others. All experts in their fields. But, there's no one else like Victoria! Do read the Surfaces Blog and let me know what you think.